Plein Air Painting at The Chautauqua Festival – an Arctic Blast! CLICKHERE for larger image, detailed view. Click HERE for larger image, detailed view. Click HERE for larger image, detailed view. It was cold! The high last Friday was 38°! That’s cold for Northwest Florida! That’s cold for outdoor painting! I had made plans to paint at the Florida Chautauqua Assembly with other plein air painters. I was prepared for the cold, dressed in my quilted snowsuit overalls and two jackets, a fleece headband visor, and cloth gloves under my latex painting gloves. And I wore wool socks inside my beach Crocs. I looked like someone from the Arctic North, but I was toasty while I painted on the shore of Lake DeFuniak last Friday morning. But later in the afternoon, the chill set in, and I was pleasantly surprised when a dear friend, Eda Busby, brought me hot tea and a blanket and fingerless gloves, which gave me more dexterity. I gave her the painting I had just completed. Saturday was almost the same, but Sunday was a warmer, and I actually was in shirt-sleeves for a little while, painting the restored DeFuniak train depot and railroad tracks. It was my first time attending the Chautauqua Festival, so I didn’t really know what to expect. I found the well-organized art exhibit on the second floor of the “Hall of Brotherhood”, also known as the Chautauqua Building, and I met some of the friendly and talented artists of the northern part of Walton County. They allowed me to bring in my wet oil paintings as I completed them. We also displayed completed works. 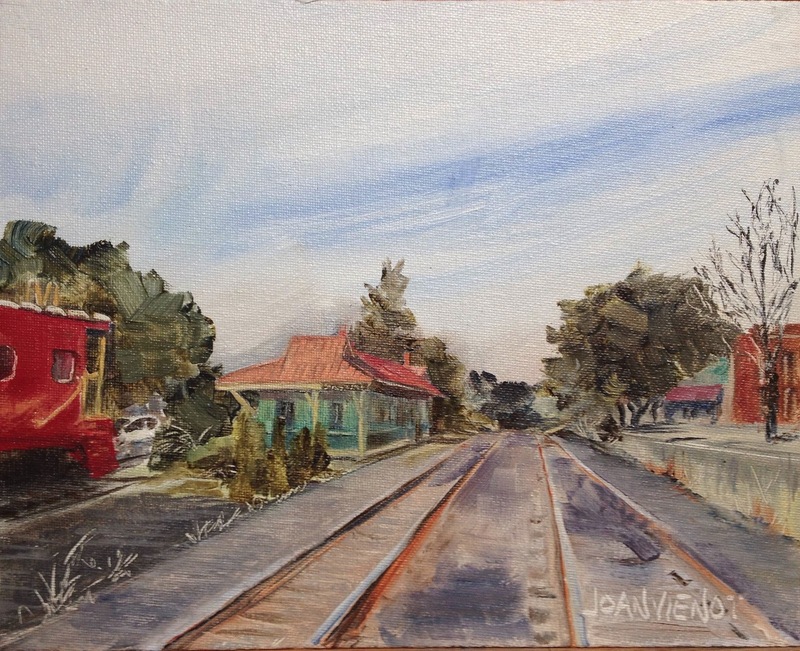 Three other people painted plein air over the weekend. Several of the artists opted to paint indoors, in the gallery. The festival itself had a number of historical exhibits and people dressed in period costume, with Civil War re-enactments accompanied by some unsettling firing of guns and cannons that made me jump and the geese honk. My favorite exhibit demonstrated a small part of the culture of the Muskogee Creek people, where a woman named Debbie Bush showed me her family’s fabric pattern on her skirt, and talked to me about herbs used in healing and she gave me a sharp piece of flint to carry in my pocket for personal protection. Another exhibit featured carved and assembled crafts and toys. i was fascinated with an assemblage of wooden “cards” strung together in a way that they unfolded in a strand and then each flipped over successively into a strand facing the other direction when the top card was flipped. The demonstrator called it “Jacob’s Ladder” — Click here for a 30-second video of the demonstration. I also tasted my first (and last) Funnel Cake, paying about $5 for a dinner-plate-sized dollop of batter fried into bread and smothered with powdered sugar. I don’t think there was one redeeming quality — I managed to force down my 1/6 slice, and left the rest on the counter for my fellow artists to enjoy. I came back a couple hours later and noticed it was gone, much to my relief. One of the historical homes on the Circle, DeFuniak Springs, Florida Frozen fountain, painting plein air in 38° Debbie Bush, Muskogee Creek cultural display Eda Busby brought me hot tea! Lest I leave you completely disillusioned with the temperatures in Florida in January, here’s a warm studio painting inspired by the lakeside grasses in Grayton Beach State Park! I am painting 3 weekends in a row, or at least I plan to. Let’s just say I’m taking my vitamins, in preparation for that much painting! Last week I went to the Oak Marina, in Niceville, for the weekly outing with the Emerald Coast Plein Air Painters. It was a bit breezy and chilly, but nothing like the 40 hours below freezing the week before! I dare say no one here in Northwest Florida was out painting that week! I know I wasn’t — I was huddled by the fireplace. This week I just put on my wind pants and turned up my collar. I was working on a canvas panel that I had underpainted with a sort of a russet color acrylic, which initially I regretted, because it was difficult to cover when I was trying to paint my sky. Later in the painting I achieved the results I had wanted, when I scratched down to the underpainting for the detail lines. Accomplished fellow painter Charlotte Arnold told me to feather downward on the juicy paint to turn my splotches into Spanish moss, on the huge oak bordering my painting. This past weekend was highlighted by the annual 30A Songwriters Festival, one of two amazing festivals produced by the Cultural Arts Alliance, the area arts organization here where I live. I was privileged to work with my friend Leslie Kolovich who produces podcast interviews. She had several singer-songwriter artists and groups in her studio over the weekend, who performed live and impromptu for us. You can listen to those podcasts at www.supradioshow.com. Below is a quick iPhone photo of THE Jeep Rosenberg being interviewed (I love this job). In the mornings I painted plein air in the gardens at Grayt Grounds of Monet Monet, the wonderful coffeeshop and event venue that is displaying some of my work. They put my work on easels throughout the gardens, for the weekenders strolling through with their coffee, who chatted with me while I painted. It was downright cold the first day, so I looked like the Michelin Man, dressed in my quilted snowsuit. The second morning was much warmer, and I enjoyed the sounds of a band playing for the coffeeshop patrons while I painted. Grayt Grounds is selling my work online too: Click here! This weekend on Friday, Saturday, and Sunday, January 24-25-26, 2014, I will be painting “on the circle” around the lake in DeFuniak Springs, FL, for the Chautauqua Festival. A number of painters from our local plein air group will be there, as well as some traveling specifically for this event. The festival has dedicated a room for us to hang our wet paintings, and has invited us to show our work. On Friday the 24th, I also will be attending the opening reception for the A+Art “Outdoor Magic” exhibit of plein air paintings at the South Walton Center of Northwest Florida State College. I might still be in my painting clothes!! And the weekend after that, on Superbowl weekend, I will be painting in Rosemary Beach, during the Girls Getaway, again with other local plein air painters. Anyone can paint at these events. If you want to paint with us, you may contact me through this website and I will put you in touch Beckie Perrott, who graciously informs us of all these plein air opportunities. This last painting I made this weekend, was one of the two stone Chinese lion statues in the gardens at Grayt Grounds. With the typical bugged-out eyes, and a large pearl in his mouth, this iconic statue was harder to paint than I thought it would be. I ended up not painting much of the surrounding foliage, spending most of the time trying to capture his face. This lion was different than most of this type. Most of these are in pairs, as is this set, and the male lion has a ball under his right foot, and the female an inverted cub under her left foot, but this lion has a four-legged critter sitting under his right foot, a critter I could not identify. I’ll have to ask the owner, who owns the jewelry store next to the coffeeshop.